Yes, it’s another freely distributed software Friday and today’s offering is a gem. If you hate typing the same phrases over and over, or often find yourself copying and pasting the same paragraph or sentence over and over, you’re going to love RiccardoÊEttore’s masterful TypeIt4Me. Here’s one I created just today… ’cause I expect to be typing this phrase a lot… When I type "imr" followed by either a space, a tab, or a carriage return, TypeIt4Me expands it into "the Inside Mac radio show." Best of all, I can continue typing and "the Inside Mac radio show" will still appear in the right place. 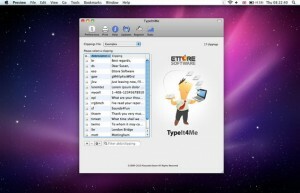 If you’re a fast typist, or often type the same text more than a few times a day, you’re going to LOVE this little gem. While falling into the category of freely distributed software, make no mistake– TypeIt4Me is commercial-grade software and a bargain at $27. When you pay the license fee, you’ll be emailed, faxed or mailed a code to stop the reminders to pay which will appear frequently on your screen after the initial 30-day trial period. 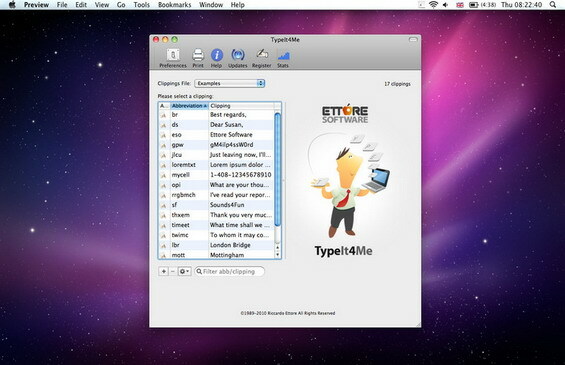 Registered users of the Classic version of TypeIt4Me (4.8.2 or older) can upgrade to the OS X version for the sum of $9. "Check it out. It’s one of my favorite pieces of software."